Hidden under the surface of everyday London is a city of monsters and miracles, where wild train spirits stampede over the tracks and glass-skinned dancers with glowing veins light the streets. When a devastating betrayal drives her from her home, graffiti artist Beth Bradley stumbles into the secret city, where she finds Filius Viae, London's ragged crown prince, just when he needs someone most. An ancient enemy has returned to the darkness under St Paul's Cathedral, bent on reigniting a centuries-old-war, and Beth and Fil find themselves in a desperate race through a bizarre urban wonderland, searching for a way to save the city they both love. 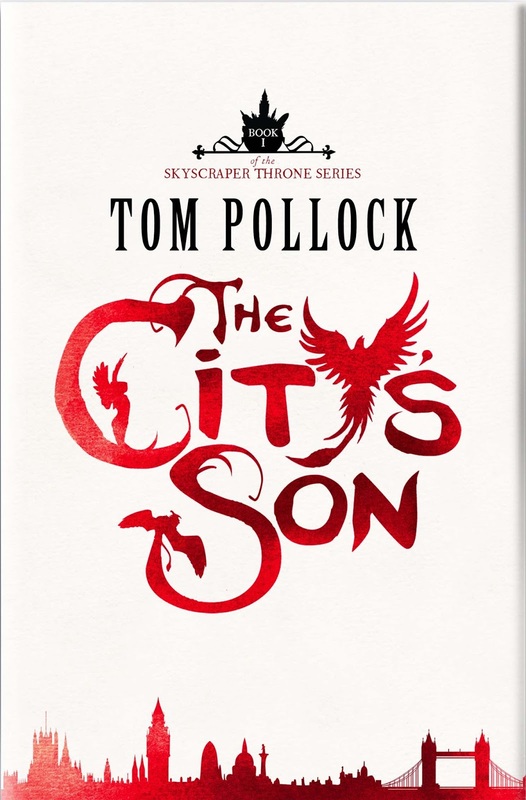 The City's Son is the first book of The Skyscraper Throne: a story about family, friends and monsters, and how you can't always tell which is which. 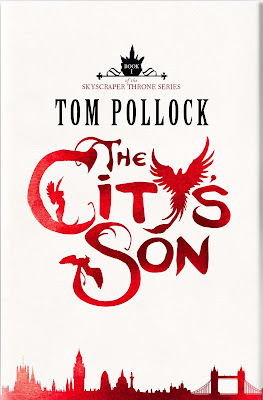 The City's Son is an impressive debut and a great introduction to the Skyscraper Throne trilogy. Tom Pollock has taken the London we know and love and brought it to life with a vast array of weird and wonderful creatures that you will never have come across before. The amount imagination that has gone into creating this sinister and dark side of London is astounding and I absolutely loved discovering the ghostly railwraiths, pavement priests, people made of glass and so much more. I think one of the things I loved most was the way the characters embody London and how at the same time the city becomes a character all of it's own. You never know what the author is going to throw at you next and I'm sure you'll be delighted with the things you uncover. Graffiti artist Beth has spent hours exploring the less well known parts of London with her best friend Pen, she loves her city but has no idea of the hidden wonders that are right under her nose. A chance encounter with Filius changes her life forever as he opens her eyes to things she never even dreamed of. She suddenly finds herself having to choose sides in a war that most people don't even realise is going on around them. Fil is the son of the Mater Viae, the goddess of London, and in her absence it is up to him to fight against her mortal enemy, the Crane King known as Reach. With Beth's help Fil needs to rally his mother's troops but will they trust him to lead them to victory? I really enjoyed seeing Fil's London through Beth's eyes, she's as new to everything going on around her as we are and her amazement was catching. We see not only the depth of London's history but also the futuristic glass skyscrapers that change the city skylines on almost a daily basis. These two very different sides of London are fighting against each other in a battle like nothing you've ever seen before with Fil and Beth right at the centre of it. Fil has grown up on the streets of London and doesn't even remember his mother, he is used to being able to do whatever he wants but he has always had the hope that his mother would return one day to deal with Reach herself. When it comes to a point that he must take action he is lost and doesn't know where to start, it is only with Beth's help that he starts to take his responsibility seriously and plan a counter attack against Reach. While Beth was a likeable character I have to say that the person I felt most connected to was probably her best friend Pen. The two girls didn't part on the best terms but when Pen comes searching for her friend she is unprepared for what she will find. The scenes from her point of view were harrowing to say the least but she show so much strength and I'm delighted to learn that she will be the main character in the second book, The Glass Republic. My heart absolutely broke for the things that she goes through and I'll be very interested to see how she copes in the aftermath of everything she has suffered. Other memorable characters were Fil's nanny Gutterglass, a creature who builds itself bodies out of any old garbage that just happens to be lying around, and Victor, the Russian drunk who takes Beth under his protection. They both added humour to what would have been very a dark story without them. If I had one complaint about the book it would be that Beth and Fil's relationship seems to develop a little too quickly. I'd really have liked them to spend more time becoming friends before romance was introduced and I found their relationship unrealistic because it happened so fast. Thankfully that is a minor complaint because their relationship is by no means the focus of the book so don't let that put you off giving it a try. If you're looking for a unique story that really brings London to life then you won't want to miss out on The City's Son! Great review, I thought this book was brilliant!